ll our products are highly acknowledged among clients for their attractive designs, embroidery, attractive colors, supreme quality and a long shelf life. We work to attain maximum customer approval and satisfaction, boasting on a very friendly working environment, which is attained by working in close coordination with each other. In zest to understand and meet the precise needs of our valuable patrons in the most efficient manner, our professionals follow customer centric and ethical business practices while dealing with our patrons. Mr. Aashish Vijay is the owner and Managing Director of the company under whose guidance the company has grown many folds. Owing to his experience and knowledge of this domain the company is able in catering to the precise needs of our valuable patrons. Working with the likes of "ABC Carpet & Home, NYC" he has tremendous knowledge of international market. His excellent management skills, ethical business practices and customer approaches have helped in winning commendable position in the field of Soft-Home apart from the trust of our patrons. Ms. Anuja Vijay is the Creative Head and backbone of the company. 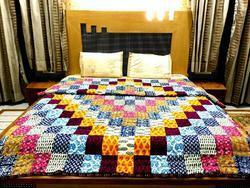 She is a NIFT, Delhi alumnus and a textile designer. Her designs and depth of knowledge in the field of textiles has helped the company in achieving tremendous growth and appreciation from all around. Ms. Vikita is the head of the accessories designing team and has taken care of the accessories division of the company. Her impeccable designs in clutch bags with unmatched quality has gained tremendous appreciation. A jewelry designer by profession with a work experience of over 8 years has helped the company is establishing a new line of women accessories.